Answer: I’m happy to hear you found the right telescope. Welcome to the amazing hobby of astronomy. For other readers, DS is referring to the “buy your first telescope” links I provided here. You can read my August 18 post here. It provides some important guidelines for newcomers to astronomy, especially those thinking about buying a telescope. Transient lunar phenomena (TLP) are short-term events visible on the lunar surface, and you won’t need a really powerful telescope to see them. TLP appear as visible changes in the otherwise static lunar landscape. They can occur over periods of minutes to hours, and require only patience and a steady eye to discover. Reports of TLP are difficult to verify, since they are “transient” and seldom photographed. Do a Google Images search for moon TLP and you’ll see there are many claims of legitimate observations, but a limited number of actual TLP images. I’ve spent hours watching those “hot spots” and have yet to see a TLP. 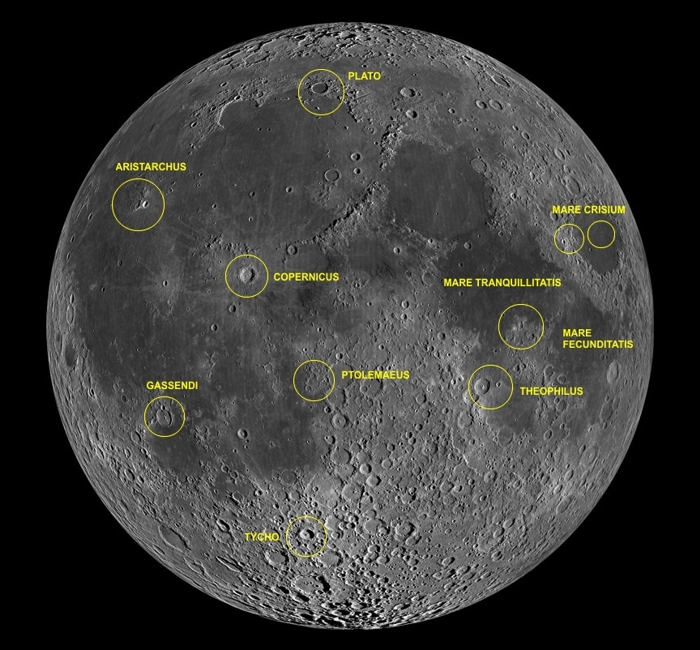 I usually focus on the area around the crater Aristarchus (top left in the graphic), where there’s been the greatest number of claimed TLP sightings. I wait for an evening when the Moon’s phase is between First Quarter and Full, when Aristarchus is still in the dark part of the lunar disc, so any luminous emissions will be more easily seen. Some TLP are better seen on the illuminated part of the lunar disc. Whatever type of TLP you’re looking for, I’d recommend going with a magnification of 150-250X. Once you’ve settled in on your target area, plan to keep watching for a least a few hours. A comfortable chair helps a lot. I know a few people who specialize in this type of observing. They attach a video recording device to the telescope, and set the scope to automatically follow the Moon all night. The next day, they fast-forward through that video looking for TLP. Because most TLP appear gradually, they’re easier to notice when video playback is faster than real-time. There’s a sub-category of TLP caused by the interplay of light and shadow as the terminator moves slowly, from west to east, across the lunar landscape. When observing through a telescope, you can see the terminator move, changing the illumination of mountain peaks and craters. It’s a slow process … like watching the hour hand on a clock, but you will see changes over the course of 5-10 minutes. The most well-known example of this type of TLP is probably the “Werner X.” There’s a link to a video of that feature in my April 23, 2012 post Light & Shadow: Sunrise on the Moon. And there’s another sub-category of TLP caused by the impact of meteors on the Moon. They can generate a visible flash of light, don’t last very long, and rarely appear larger than a “point.” But if they hit on the dark part of the Moon, they can often be seen with the naked eye — IF you happen to be watching at the right time. For example, see this NASA video on YouTube (RT = 4:00). When a meteor shower is predicted for Earth, some observers watch the Moon instead of the sky. Meteor showers are spread over a relatively large volume of space. If meteors are hitting the Earth, some are also hitting the Moon. Whereas most meteors burn up in Earth’s atmosphere, on the airless Moon all meteors reach the surface unimpeded. On impact, vaporization of material from the meteor and the lunar surface produces a brief flash of light.